The audience members cheered loudly, yet they wanted to give more. Realizing the blind marching band students would not see their standing ovation, the spectators used their feet to stomp and raise the volume of their appreciation. It was a moment the members of the Ohio State School for the Blind Marching Band will never forget. 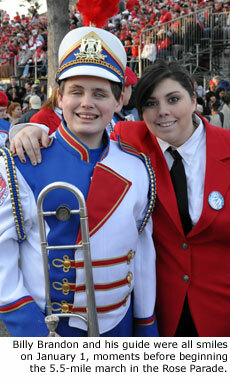 "One of our students was bawling afterwards," said Carol Agler, the band's sighted co-director. "I asked what's wrong and he said, 'I'm just moved by all the support the crowd's giving us.'" The band had just completed its field show performance at the Tournament of Roses Bandfest, an exhibition that showcases the marching bands gathered in Pasadena for the Rose Parade. This crowd response was just an early taste of how well the band would be received during its trip to California for the 2010 Tournament of Roses Parade. Band members were energized by their accomplishment. Trombone player Billy Brandon said, "It puts out a challenge for you, and if you accomplish it you feel really good about yourself." Tenor sax player Marty Bateman added, "We want to show the world what blind and visually impaired people can do." And that's exactly what they did, many times over. The 32-member marching band entered the field with the help of personal marching assistants. Ten students have low vision, while the others have only light perception or total blindness, according to Agler. 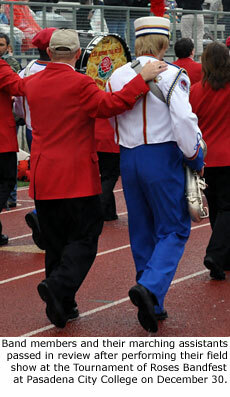 Each guide marched alongside a band member and gently placed one hand on the members' shoulder. At times the guides stepped away and framed the band's formation on the field, giving the students full ownership of center stage. A highlight of the performance was the band's "Script Ohio" formation  in Braille. Similiar to Ohio State University's tradition of forming the letters O-h-i-o and dotting the "i" with a tuba, the School for the Blind spelled Ohio using the Braille dot pattern for each letter. The crowd roared when a tuba player jumped into position to complete the letter "i." "There was so much energy you could feel it," said co-director Dan Kelley, who has been blind since birth. Kelley stood atop a drum major podium and used a microphone to speak commands to the band and to joke with the audience throughout the show. "It just lifts you up. The response was above and beyond what I thought it could be." The uniqueness of an entire marching band of blind students drew widespread press coverage leading up to the band's appearance. Kelley said the media attention is more than he is used to, but he is thankful for opportunities to talk about the band. Just one day earlier he was interviewed remotely by television news anchor Diane Sawyer. "It's great to share what we're doing with as big an audience as possible," Kelley said, adding that he can't think of a more prominent venue for marching bands than the Rose Parade. Although the band is unique, the preparations for the trip to Pasadena were similar to what any marching band would experience. 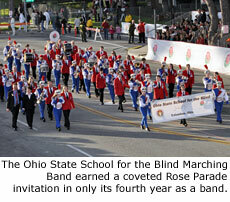 Band members were involved in fundraisers such as concerts, the sale of Rose Parade lapel pins and a golf event. Families, friends and organizations rallied to help the band in every way possible. Agler said it was rewarding to see the public outpouring of support. "Lions clubs in Ohio pledged to raise half of what we needed," Agler said of the Lions organization, which focuses on sight-related causes. "We've been able to meet the minimum, and go beyond to get all the things that weren't essential but were nice to have." Billy Brandon said the band had been holding two-hour rehearsals for "months and months" in addition to an intense band camp where members learned the show. A physical therapist offered tips on how to get fit for the march down the long parade route. Brandon said confidently, "We're going to make it for the five-and-a-half miles." The volunteer marching assistants  who represent a broad range of ages and relationships to the students  were also involved in the preparations, attending rehearsals to learn the marching formations. "Some of the guides are relatives, some are students from area schools," Agler said. "We have a grandmother, grandfather, retired band director, and even the guy who directs the buses at OSU. Sam, our trombone player extraordinaire, is a triplet. His triplet brothers are marching assistants, as is his older brother." One big difference from other bands is how quickly the Ohio State School for the Blind Marching Band made it to the national stage. Most bands marching in the Rose Parade have lengthy résumés of awards, some spanning decades of excellence. The School for the Blind's band is currently in only its fifth season of existence. Agler said the school expanded its music program to include a marching band in 2005, when the Ohio State School for the Deaf revived its football program. The two schools are both located in Columbus, Ohio, just a five-minute drive from each other. "We became their marching band," Agler said. "Up to that point our high school band served as a pep band, jazz band and concert band. 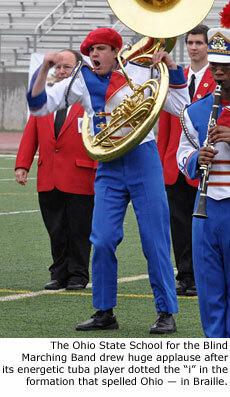 We added marching band during the 2005-2006 season for the deaf school's home football games." The introduction of a marching program at the Ohio State School for the Blind proved to be exciting and life-changing for students and spectators. Band members take pride in their accomplishments. Spectators are inspired by the band's performances. Reflecting on what the trip to Pasadena means to her personally, bell player Hannah Siemer soaked up the whole atmosphere at Bandfest. "When I was in fifth grade, I thought I could never do marching band," Siemer said. "I thought it was a sighted thing that I would have to leave out." To learn more, visit the Ohio State School for the Blind website.